There is nothing more compelling than a person's story. And what's more, to hear such narrative through film. The Graduate School, through a series of short graduate student testimonial films, hopes to capture some of the essential elements of graduate life at Maryland. A direct result of recommendations by two graduate life committees from this past academic year, the project is the outcome of conversations among faculty, staff and graduate students. Helmed by rising filmmaker Ramsey Telhami, the series casts a diverse net among the graduate community - from underrepresented doctoral scholars, international students to a veteran. 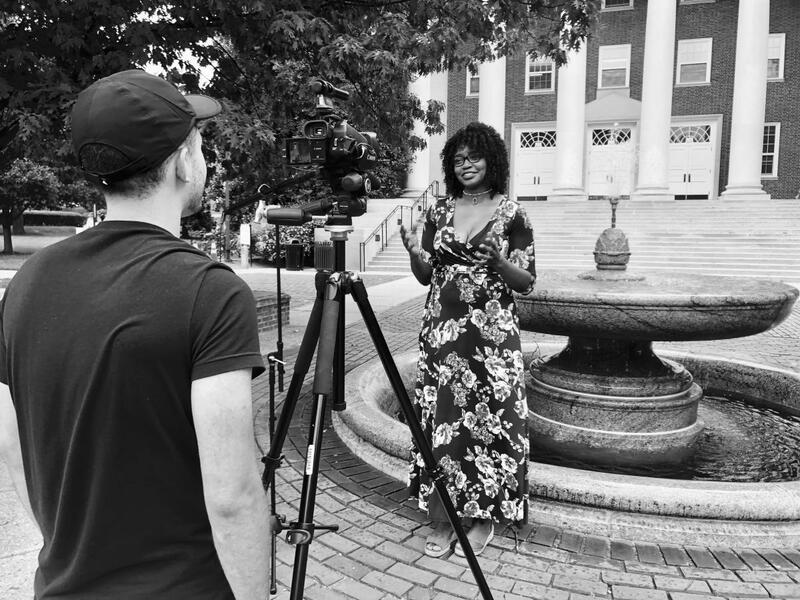 Over the course of four days this week, filming took place at various iconic locations on campus to showcase UMD's extraordinary sculptures, buildings, and gardens. The 16 graduate students involved in the project, from various schools/colleges, programs, and backgrounds, tell remarkable stories of scholarship, support and colleagiality. Telhami, a current undergraduate in Sociology, has been involved in media production for over 6 years. Trained in film at the Rochester Institute of Technology, Telhami has worked as an Assistant Director trainee in the Morroco unit of Ang Lee's Billy Lynn's Long Halftime Walk, and as a Sound Recording assistant for the pilot of NBC TV show The Brave. Telhami, who is of Israeli-Arab ancestry, has directed several short films, and is currently developing his first feature film, a slice-of-life thriller about a man caught between Arab and Israeli loyalties during the rise of Israel's far right. 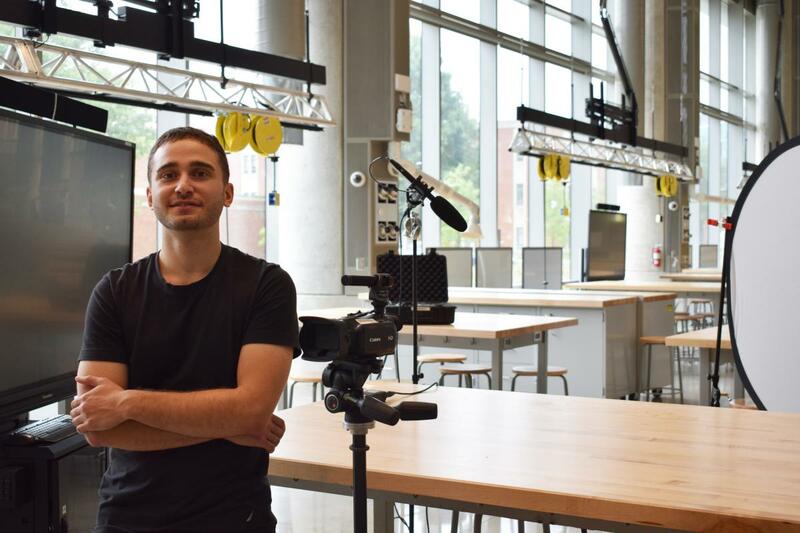 "I hope to communicate what it's like to be a grad student at UMD, and the possibilities that it brings, in the compact, vibrant, and accessible way that film does best," says Telhami about the UMD project. The films, which will launch sometime this fall, also aim to make the graduate experience more accessible to potential students from all walks of life. Participants include Lauren Ramsey (Public Health), Rishvi Jayathilake (Chemistry), Yooni Choi (Public Health), Sarah Beckwith (Business), Leo Torres (Bioengineering), Nabila Hijazi (English), Matthew Aruch (Education), Aakash Aggarwal (Telecommunications), Dana Arbaugh Varona (Music Education), Ross McCool (Music), Theo Cruthers (Public Policy), Jessica Stern (Psychology), Jonelle Walker (Theatre), Yu (Amber) Ma (Business), Ana Sanchez-Rivera (Geographical Sciences), and Stephanie Allen (Applied Mathematics). Concludes Jayathilake, a doctoral student, "I think it is really helpful to hear directly from graduate students about their experiences on the UMD campus, and beyond. The fact is that our graduate community is diverse - from underrepresented students to international scholars like myself, and more. This film project hopefully presents who we are, and what we wish graduate education to look like in the future."